Today's gloomy skies didn't dampen (no pun intended) our enthusiasm to sketch at and around FAO Schwarz. The store is headed for closure, but it was most certainly busy today. Outside was a greeter dressed like a toy soldier who was constantly busy posing with people outside the entrance. It was hard to get a photo or a sketch done without someone besides him in the picture...so I included a visitor. When it started to sprinkle some of us headed into the store. I think I could have spent days there sketching. There were so many things I wanted to sketch. 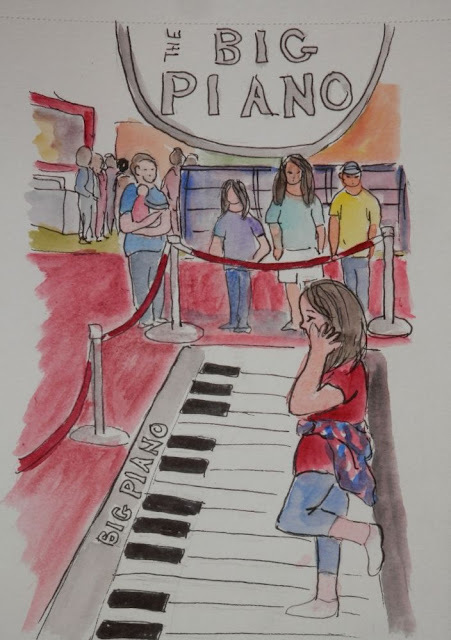 This was my first trip to FAO Schwarz so I knew I had to find the "Big Piano" what the movie "Big" made so famous. I had to sketch that if nothing else. I had a hard time deciding where I could stand to sketch without being in the way...off to the side seemed to work best. The people on the piano changed quite quickly so sketching them was not so easy. I decided to focus on just one girl and included some of the people behind her. After lunch we headed over to the carriage horses who also may be leaving the city. They are a definite draw for tourists and were very busy today. 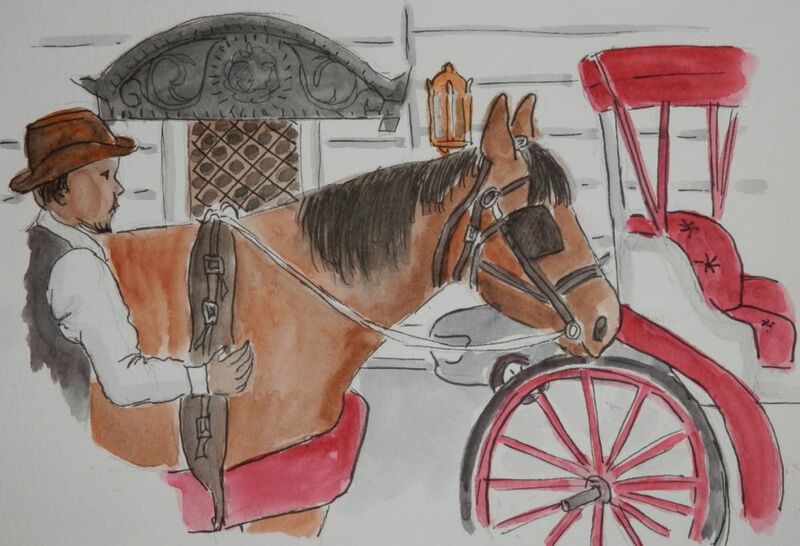 We had two horses and their drivers in front of us for a short while so I concentrated on the sketch of this horse and driver before they moved away. I added another carriage that replaced them a while later. I needed to include a bit of the Plaza in the background for atmosphere. Today was much too short a day for sketching. There was so much more I would have loved to sketch. Maybe we/I will just have to return. Good comment - great sketches. There was something sketch able "everywhere". 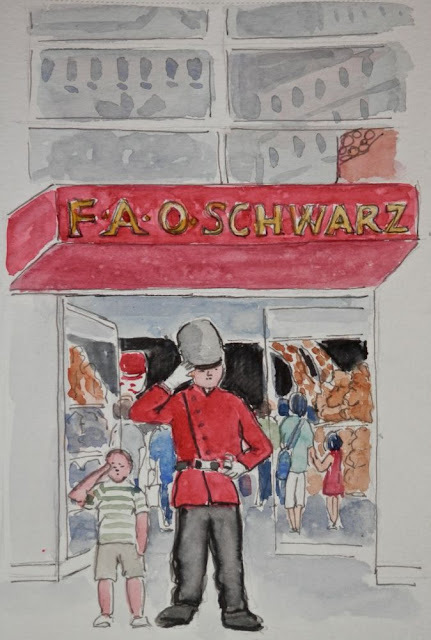 The first sketch is a classic with the kid saluting with the guard. It says so much about the FAO Schwarz experience. So glad you were there to capture it before they close. You captured a good representation of the day. I could have used a few more days at that location! Thanks Mark and Susan. It is so sad that they are closing the store...and where will all those stuffed animals go? lol Maybe you can adopt a giraffe, Susan. 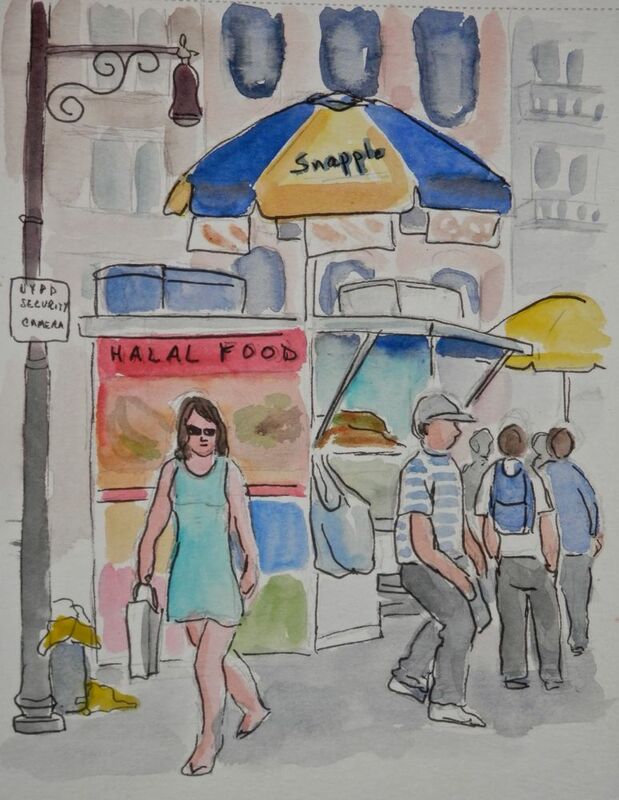 these sketches are such great mementos of the day--and of soon-to-be relics of our nyc. particularly love the horse and driver with the details of the plaza behind the. was fun hanging out together. Thanks, Shawne. It was a great day to be out with sketching friends! !